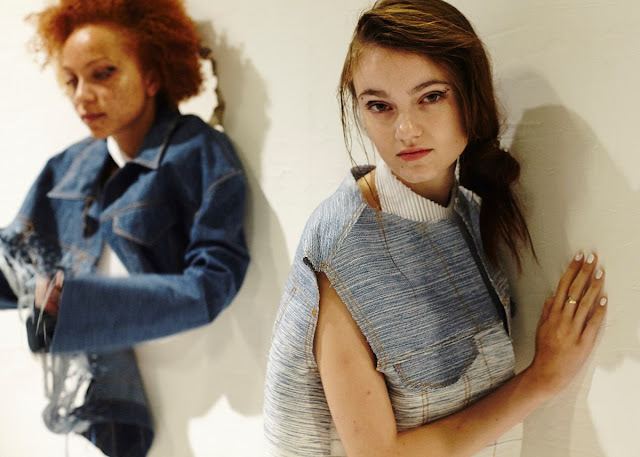 The last time I saw a Faustine Steinmetz collection it was a Saturday morning in February. She had just been shortlisted for the prestigious LVMH Prize. The recipient of this years 300,000 went to Marques’Almeida, another London-based brand. The process and candidacy presented Steinmetz with greater exposure and confidence. For Spring 2016, she enjoyed further funding from the BFC. She occupied the presentation space at the Institute of Contemporary Arts on a Saturday morning, this time in September. Making the most of the presentation space, models were scattered across the room against a white wall. 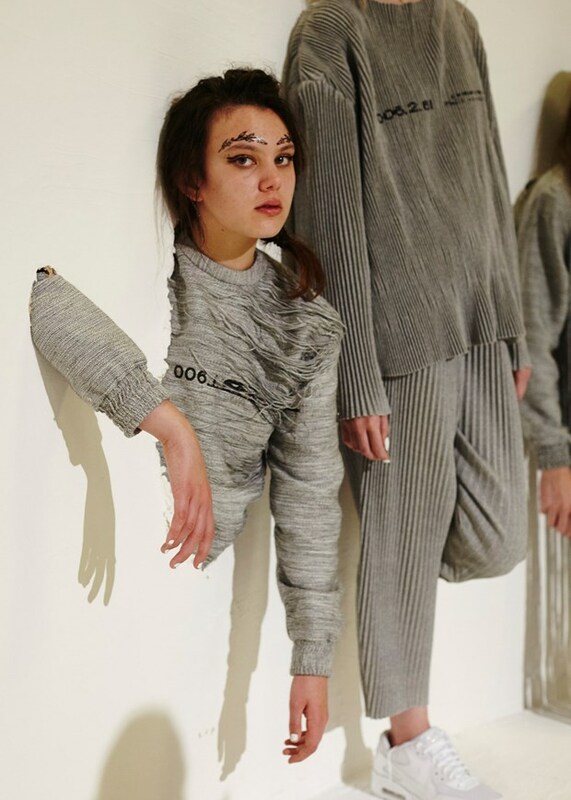 Some models were literally a part of the exhibition: their bodies poked out of the wall. In her early days, Mary Katrantzou became known for her prints. There wouldn’t be a piece about Mary that didn’t have print in it. The fashion world went crazy when she didn’t employ what they thought was her signature. Instead she focused on surface decoration, which she continues to do. Faustine Steinmetz and Mary Katrantzou are similar in that sense. 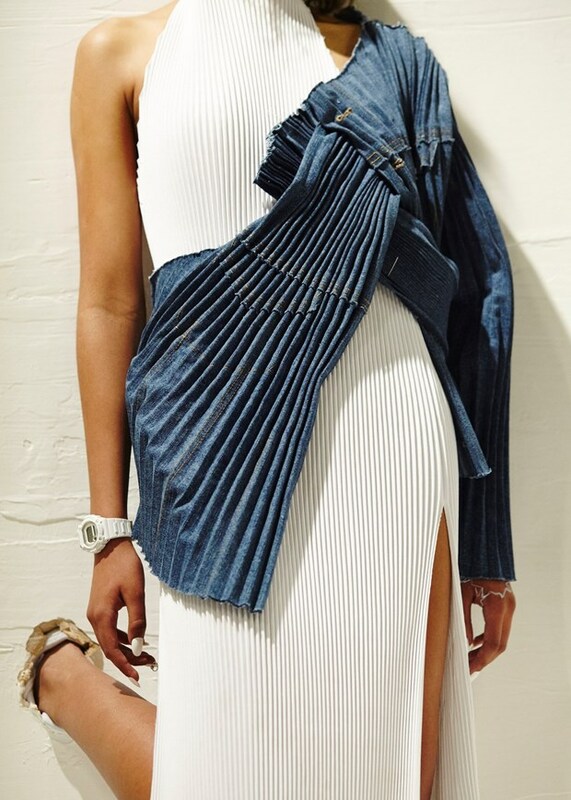 Steinmetz burst onto the scene, famed for her innovative use of denim. ‘Faustine Steinmetz’ and ‘denim.’ Like complementary goods, they’d be no use without one and other. Faustine has yet to radically change, but the subtle gravitation towards non-denim product is a welcome and appropriate change. A black and white, off-the-shoulder dress had lengthy frays all bunched together in a large knot. One uniform-like, black and white dress had a slash in the upper thigh. Frayed denim and micro-pleating perfectly complemented in each other. The white dress with an asymmetrically-cut neckline was perhaps the most commercially driven piece I’ve seen from the designer. Maybe the expansion from denim is experimentation combined with a smart business move. Considering the nature of the set and the designs, one could draw to the conclusion that Steinmetz is finding her footing, more confident in her already fantastic output. And as the set would imply, this was a breakthrough collection.